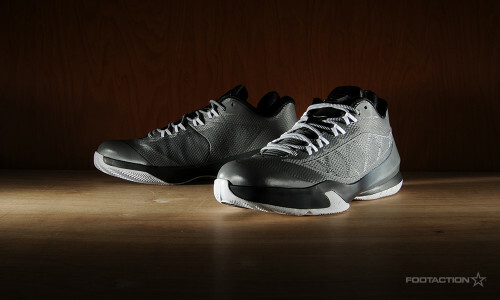 As the Los Angeles Clippers star point guard starts out the 2014-15 NBA season strong, Jordan Brand unveils a new colorway for Chris Paul’s latest signature sneaker: the Jordan CP3.VIII Cool Grey. Overall, the colorway complements the sleek and minimalist silhouette which is designed for maximum performance on the court. The innovation lies in a no-sew construction as the overlays are fused to the engineered textile upper, layered cushioning systems with Zoom in the forefoot and Lunarlon and Phylon under the heel. The shoe employs somewhat of a 5/8 cut that sits between a mid and low-top shoe. Last but not least, the personal touch on the shoe is a family tree along the inside of the tongue that pays tribute to Paul’s family. Print article This entry was posted by hhcblog on November 8, 2014 at 8:19 am, and is filed under Footwear. Follow any responses to this post through RSS 2.0. You can leave a response or trackback from your own site.